The Stanley Cup final is down to a best-of-five series, and home-ice advantage has shifted in favour of the Blackhawks heading into Game 3 Monday in Chicago. Here are four things to know for tonight's contest. The Stanley Cup final is down to a best-of-five series, and home-ice advantage has shifted in favour of the Blackhawks heading into Game 3 Monday in Chicago (CBC, CBCSports.ca, 8 p.m. ET). Several questions have arisen after the first two games, chiefly who will be in goal for the Lightning and where have the sharpshooters gone? A pair of wins in Tampa Bay would have been perfect for the Blackhawks, but they accomplished a major goal by managing a split in the first two games, giving themselves the ability to win the series by sweeping their home games. Chicago's been the most effective home team during the playoffs, with a 7-1 record at the United Center. The Blackhawks' lone loss there came in the Western Conference final with a 2-1 loss to the Anaheim Ducks. 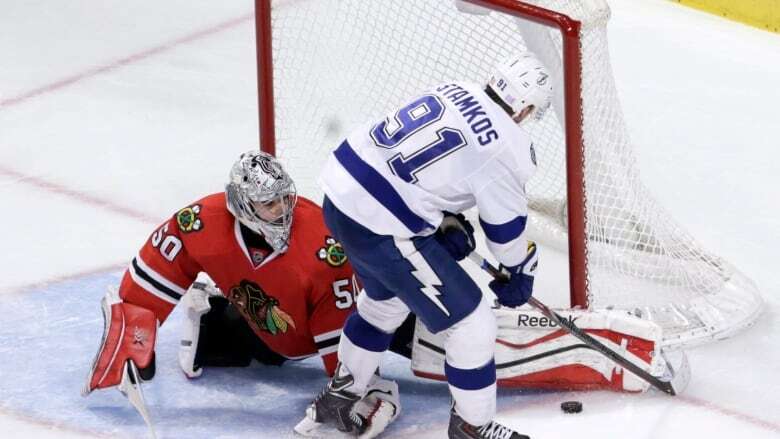 The Blackhawks have also had problems with Game 2s in the playoffs, losing the second game in three of four rounds. The exception was a 4-1 win in the conference semifinals where they swept the Minnesota Wild. Having the last line change Monday will allow coach Joel Quenneville to keep top scorers Jonathan Toews and Patrick Kane away from the Lightning checking line centred by Cedric Paquette, and also Tampa Bay's key defence pair of Victor Hedman and Anton Stralman. Quenneville split up Toews and Kane in Game 2, but with the Blackhawks now having the last change they'll likely be reunited in Game 3. Both teams' star players have been quiet. Kane and Toews were limited to only one point, an assist by Toews (his 100th career playoff point), on Chicago's third goal in Game 2 that tied the game at 3-3. Toews and Kane carried the offence for the Blackhawks when it was needed most in the seven-game series against the Ducks, particularly in the final three games. Lightning captain Steven Stamkos was held off the scoring sheet for the fourth game in a row in Game 2 and has been streaky to say the least during the playoffs. He had but three assists in his first eight games before erupting for seven goals and a like number of assists in 10 games in the middle of the playoffs. Now he's gone silent again. "You can't score every night," Tampa coach Jon Cooper Cooper said. "Unless your name is Gretzky." Cooper wasn't quite as forthcoming when the subject was the Lightning's goaltending situation. In Saturday's 4-3 win over the Blackhawks, 20-year-old Andrei Vasilevskiy twice replaced Ben Bishop in goal in the third period as Bishop retired to the dressing room with a mystery ailment. After his first absence, Bishop returned after 1:32 of play, but then 3:30 later he was again replaced by Vasilievskiy. What's bothering Bishop? Cooper and the Lightning aren't saying. On Sunday, Cooper would only say that Bishop might be available for Game 3. He did skate in the Monday morning practice, along with Vasilevskiy, and Bishop was the first goalie to leave the practice, suggesting he could be the Game 3 starter. Bishop said only "we'll see" when asked if he would play tonight. The resilient Lightning, who took 20 games to reach the Stanley Cup final after a pair of seven-game series against the Red Wings and the Rangers, with a six-game series against the Canadiens in between, have been most effective following a loss, posting an 8-1 record. More importantly, they've been road warriors, with seven away wins in the three previous series, including a pair of shutout victories in their last two road assignments, by 2-0 scores over the Rangers at Madison Square Garden. The Lightning may be short on experience in a Stanley Cup final, with only Valtteri Filppula owning a ring (as a Red Wing), but they're proving that they can win at any time, in any location, as the playoffs continue.